Here are some illustrations which can be used for headers. They are of sunsets and mountains and trees and valleys. The original photographs (which are by me) have been altered in photoshop to give the illustrated effect. The image of the rocky mountains below has been turned into a painting with pastel shades. It would be very difficult to actually make a painting using these colours and the shades. In the original photograph the mountains look black and white with some shades of pink and blue in the sky. This is the same image, with another effect. For those who love bright colours. This is an image is of sunrise on the Nile, a river in Egypt. The ripples in the water look almost as they are on fire. 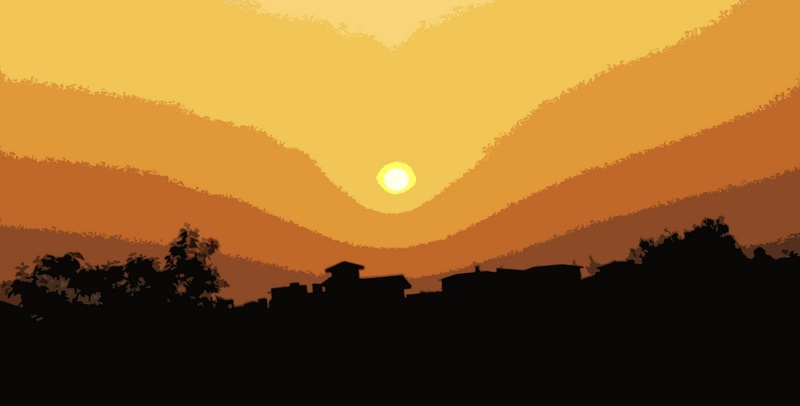 The next two are illustrations from photographs of sunsets taken on the outskirts of Mumbai. The image below is an illustration of mountains and a valley. The original photo was shot in Matheran. The picture looks almost like a photograph, until you zoom in. This last image is a simple illustration of a field and rolling hills. The tree in the foreground is fallling like a canopy over the green fields. This image too can be easily mistaken for a photo. Related Images: Try the label "Nature Headers" if you are looking for more headers of scenery.